“Town braces itself for arrival of gypsies” ran the headline in the Wilts and Gloucestershire Standard last week in reference to the bi-annual Stow Gypsy Horse Fair. The Cotswold town of Stow-on-the-Wold has held the fair since 1476, when it was granted a royal charter and it took place this year on Thursday 15th May. Thousands of travellers, most of them Romany gypsies, descend upon this decidedly conservative town, arriving in the modern caravans and lorries which have largely replaced the brightly painted wagons that visitors would have seen thirty years ago. The gypsies trade horses and erect tents and stalls selling goods ranging from plastic toys to fake mink coats for children. In recent years local residents have expressed increasing dissatisfaction with the disruption the fair brings. Political correctness is abandoned as they talk of ‘thieving gypsies’ and wonder at the fact that many of the travellers cannot read or write properly. In 2000, a court injunction threatened every trader at the fair with imprisonment if they camped overnight in the field in which it is held. The gypsies got around this simply by buying the field. At Stow’s Tourist Information Centre the polite, well-dressed lady manning the desk informed us that the event wasn’t welcome but that the authorities were powerless to stop it. 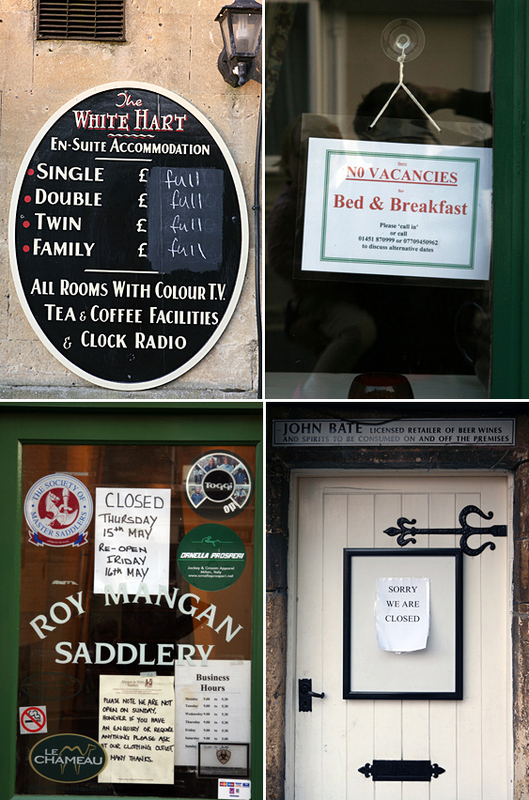 She talked of businesses deciding to close, rather than face theft or damage to their properties and sure enough, most of the shops, B&Bs and local pubs all had hand-written ‘closed’ signs hanging in the window. 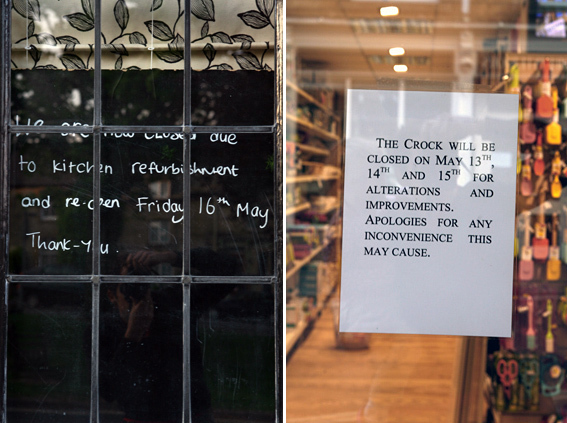 I particularly liked the unnecessarily elaborate notes pinned in some shop windows. “We are now closed due to kitchen refurbishment and re-open Friday 16th May” (the day after the festival) and “The Crock will be closed on May 13th, 14th and 15th for alterations and improvements” (no sign of alterations when I passed). A few days later, while staying on a small campsite in the Forest of Dean, we heard the unmistakable beat of a large sound system booming out in the middle of the night. An all night rave in this ‘heart-shaped land’ that inspired the term ‘picturesque’ and all those genteel 18th and 19th century tours! (see footnote below). Our fellow campers were not impressed. The owner of the campsite relayed the latest information in disparaging terms every time her telephone rang. I cycled off in search of this spectacle, lugging my tripod and camera on my back. It took me an hour to find it, but it was worth it, greeted as I was by the surreal sight of a transit van spilling out huge speakers, around which were gathered about fifty people all distinctly the worse for wear, head banging and lolling around, but in a beautiful pine clearing in the forest. I managed a few pictures before the police arrived and stopped the proceedings. (For an online article about raves in the Forest of Dean see this link). The Wye Valley and Forest of Dean witnessed the birth of British tourism in the eighteenth century. The area became widely known following the publication in 1782 of Observations on the River Wye by the Reverend William Gilpin. The first illustrated tour guide to be published in Britain, it helped travellers locate and enjoy the most “picturesque” aspects of the countryside. The Wye Valley’s particular attraction was its river scenery, and the many guidebooks, engravings and paintings ensured a continuing steady stream of visitors which grew after the building of a new turnpike road up the valley in 1822 and the opening of a rail line in 1865. This entry was posted on Wednesday, May 21st, 2008 at 1:38 pm	and is filed under EVENTS & PASTIMES. You can follow any responses to this entry through the RSS 2.0 feed. Both comments and pings are currently closed.